Well yes things are getting better, and I feel stronger. This was a run down the bog road, and while the track out on this first 5km is good, it gets a little ropey on the way home. 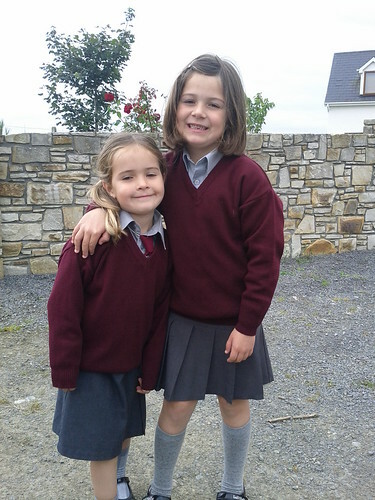 Mia and Kate waiting for their first school bus of the year, a photo by miguelpdl on Flickr. A long trip back from Mayo yesterday, so didn’t get to complete the long run scheduled, and really it was quite late (8.50pm) starting tonight to I went straight for Session 18 a shorter 50 minute stint. It’s not that the sessions are getting easier, I just feel so much better doing them. I’m going to count yesterdays walk up Croagh Patrick as Session 15. Anyway this time I finally found a quiet road, a couple of sharp inclines but nothing too bad and finally I think I managed to match my breathing with my running pace. I’m finally starting to feel good about this! No training session as such today, but a real mountainous walk up Croagh Patrick, Westport, County Mayo. It took just over 3 hours to complete, but it was worth it. Overall it was a blast ! Truly some great scenery on this run, and while I took a less used road and not so hilly I still found the run a bit tough. Well I’ve missed a session but for good reason, I’ve spend the best part of 5 hours travelling from Kilkenny to Mayo as I had a short summer break with the family to Westport. But given I had started this training programme I have to continue in some way so here’s my first session in Mayo, and boy is this place mountainous. It started off with a great run on the beach, but eventually the hills towards and back from Louisburgh were just too much. 10K Session 10: First half good, second half bad. Took a trip down the bog road today and felt great for the first 6.5km and then a gasket blew and I found the last bit of the run tough. and went for this 1 hour session, training session number 9.